Carl Johnson relating his childhood story to Wu Zi Mu, who asked him to attack a Da Nang Boys freighter. Amphibious Assault is a mission in Grand Theft Auto: San Andreas given to protagonist Carl Johnson by San Fierro Triads leader Wu Zi Mu from his apartment in the Chinatown district of San Fierro, San Andreas. Note: This mission can only be accessed from 20:00 to 6:00 in-game and requires the player to have at least one quarter of the lung capacity bar filled. Woozie tells Carl he can't swim. He easily panics just thinking about the water. Because of this, he wouldn't be able to do something he's been planning; swim to a Da Nang Boys-owned ship out at San Fierro Bay and plant a bug in it. So, instead, he wants Carl to do this. He first disagrees with the idea, narrating a humorous story he was involved in back in his childhood, making him somewhat afraid as well. However, once Woozie admits that he is, in fact, blind, and would not be able to use his other senses in the water, Carl agrees to do the task, feeling somewhat sympathy for Woozie. Carl makes his way to Esplanade North, near Pier 69. Once there, Carl dives to the water. He first navigates through a rock formation. Afterwards, he sees and avoids the Da Nang Boys patrolling the ship and the sea in Tropics. He also avoids the search lights planted on the tanker. As he arrives at the freighter, he quietly makes his way to the back of the ship, either by avoiding the guards' attention or by killing them. He eventually arrives at the back of the ship, and plants the bug. Afterwards, he quickly gets out of the ship, and swims back to a dock in Esplanade North. Carl Johnson: Hold on. You tryin' to tell me you can't swim? Carl Johnson: OK dude, see - I know you just trying to make excuses now! Wu Zi Mu: Look, CJ, I need someone from outside the Triad who I can trust. Carl Johnson: A'ight, so let me get this straight. You want me to swim around in dirty dock water, dodging little brown jelly beans and Vietnamese gangsters, to put a bug on a boat in the harbor? Wu Zi Mu: You're so negative! 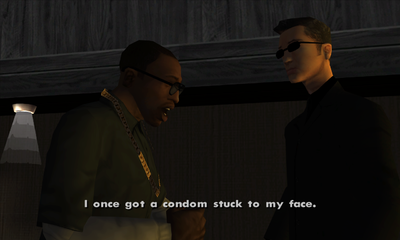 Carl Johnson: Listen, man - when I was a kid, swimming off the Santa Maria, I once got a condom stuck to my face. Carl Johnson: Horror like that stays with you for life, believe that. Wu Zi Mu: I have a confession to make... I... I'm blind. Wu Zi Mu: Yes, although I've trained my other senses to a point where you wouldn't notice my handicap, in the water they'd be quite useless. Carl Johnson: Alright, Woozie, relax. Don't beat yourself up about it. Look, I'll do it. Uh, one last thing. You do know that I'm black, right? And not Chinese. Wu Zi Mu: (Laughs) I'm blind, Carl, not stupid. The rewards for this mission are an increase in respect and $11,000. The mission The Da Nang Thang is unlocked. If the player has not yet improved their lung capacity enough, a special cutscene would be triggered. While playing on the CJD 500, Woozie asks Carl if he can swim well; Carl responds in disagreement. The game would then tell the player to improve their lung capacity by diving underwater for the mission to be continued normally. Wu Zi Mu playing a video game with Carl Johnson while asking him to attack a Da Nang Boys freighter. This scene only occurs when the player does not have sufficient lung capacity. CJ dives off the dock and under the water. CJ swims underwater past the Da Nang Boys guards. CJ quietly assassinates a Da Nang guard with his knife. CJ takes out another guard with his silenced pistol. CJ swims for the dock after planting the bug and leaving the freighter. This page was last modified on 12 April 2015, at 14:49.